Thank you for all the support and help I have had from this weeks issues. If you wish to participate during the next weeks issues, just give me a shout. We should have more interviews and Q&A's coming your way, as well as more of the segments you have already seen, and more! So just enjoy the rest of your Sunday and we will have new issues in the new week coming up. This weeks movie in the spotlight is: Anchorman 2! 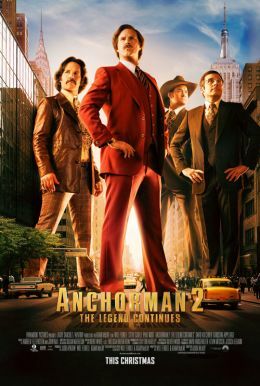 With the success of the first film, Anchorman 2: The Legend Continues hits back with more laughs and more mayhem. Keeping with the solid cast from the original, Ron, Brick, Brian and Champ are doing what they do (best?) in the New York metropolis. What could go wrong? This movie is kind of a big deal. So much so that they are releasing (starting February 28th) a 'Super-Sized R-Rated Version' of the movie! Check out the trailer for that below! We started this week with Order and Chaos. So it is only fitting we end with just one. You can climb and climb, but be sure not to falter. It's a long was down. To end the week, here's Frankie Boyle with a Mock the Week compilation.